There are a number of unspoken rules you come to live by when you have a pet in the family. If you happen to have four cats like I do, they include keeping your cool when you’re abruptly woken up by them running over you during 5 a.m. playtime; adjusting to the early morning breakfast demands that come with bops on your head, whiskers against your nose, or when that doesn’t work, having your eyelids licked (always a fun time! ); and the one-sided agreement that you are responsible for doling out pets and cuddles on their schedule, never yours. And then there’s knowing that you are almost always, without fail, running out of something. Four cats go through a lot of food and litter, and I can’t tell you the number of times I have gone to scoop a litter box or groggily walked to the kitchen still half-asleep after being woken up by a cat demanding breakfast to find that I was running low or was completely out of the supplies I needed. When you live in a rural area about 20 miles away from the nearest pet supply store, it isn’t always easy or even possible to quickly run out and grab something you need. That is precisely why I was so thrilled to find out about Petco’s Repeat Delivery service, and instantly became a loyal customer. 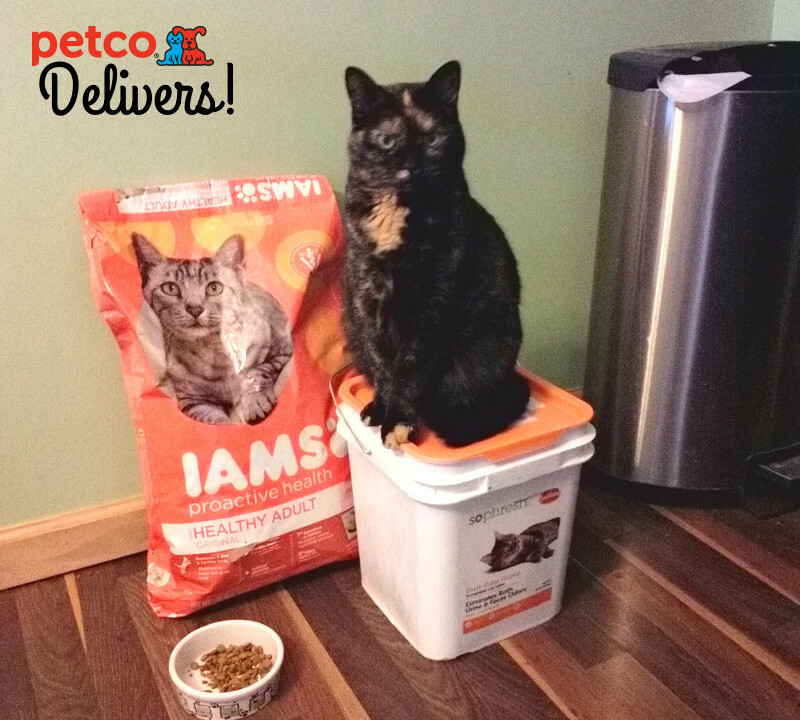 Don’t run out of pet essentials now that #PetcoDelivers everything you need right to your door. Petco makes stocking up on pet essentials easier than ever by delivering everything you need to keep your pets happy, healthy, and taken care of right to your front door. You don’t need to go into a Petco store to get started, or even have a Petco near you. Simply navigate their website to shop for your pet’s favorite products, like litter, food, treats, catnip, and more, choose how often you would like your supplies delivered (anywhere between every two weeks to 12 months), check out, and wait for your delivery. Talk about a better system than realizing you’re out of something your pets need last minute and having to drive 20 miles to the nearest store and back! The process is so easy and takes just a few minutes, plus Petco stocks a wide assortment of brands, including specialty brands, so you can rest assured knowing that you will still be able to give your fur babies the very best, which is what we all want for our pets. Repeat Delivery also offers savings that really add up, with discounts of up to 20% off select items and everyday free shipping on purchases of $49 or more. There are a few exclusions to scoring free shipping — for instance, it doesn’t include cat litter, namely because have you ever had to lug around a bulk-sized box of cat litter? It is heavy! However, by planning our delivery schedule accordingly, it can still be an awesome savings, plus I won’t have to pick up those heavy boxes or pails more than from my front door to the litter box, which is great. And if you realize you need something sooner than the schedule you had originally set your deliveries up for or wanted to put off a shipment, you can do so easily by accessing your Petco account. Would Petco Repeat Delivery make your life as a pet parent easier? Wow! This service is very convenient especially for people who are busy during the week. I love that you can have food delivered for your pet. That’s awesome! This would be a real time saver! Although I rarely run out of pet essentials, this repeat delivery service would take a chunk off my “worry list.” Thanks for letting me know. I’m not a pet owner, but I need to share this info with my sister who is. She’d love the convenience of this service. I love the idea of repeat deliveries. Especially true if you live in the country. Even more true if you live in the country in a cold state! This is a great idea to have repeat delivery for any animal owner. It is indeed so convient and you don’t have to worry about running out of anything. These are all adorable pictures of cats. Thanks for sharing the cuteness. We don’t have pets, but this service is amazing! Have to share this with my friends who own pets. I’d need this kind of repeat delivery for cleaning products. We don’t have pets but have been considering getting a dog. I will definitely keep this is mind if we do! Thanks! I love it when shops deliver. I don’t have a pet, though, but I will share this with my friends. This is such a great idea. Petco really hit a home-run with a delivery plan. My daughter has two pets and could benefit from this service. What a great idea! I have cats coming out my ears, so this would be a great service for me. I bet this is great news for all those who have pets. I don’t have any pets, but my friends do. I am sure they would love this service. Wow! This is very convenient 🙂 Thumbs up! I have been wondering about the repeat delivery system. The discount and convenience looks like a win! I’m a huge fan of delivery for any product. If I didn’t have a Petco literally around the corner from my house I would be totally psyched to take advantage of this program. Woah! Now I don’t need to go to the store! I am a big fan of scheduled deliveries for things that need to be purchased every month. I need to get on this for dog food and other pet supplies. I had no idea you can have it delivered plus schedule it too. That’s great! I have 3 dogs and we can really go through the dog food. I hate carrying those big bags from the store, this would be so much easier. Well, that’s pretty awesome! I never thought about ordering Petco. I’ll keep this in mind since we are thinking about getting a dog soon. It is always nice to find places and brands that really care about the customers. I’m glad they now deliver. Nice to know! With three cats and two dogs, having a specific scheduled date is so convenient. Thanks for sharing!